Our school, pre-school through eighth grade, provides a quality academic program and educational experience within a Catholic environment. Our goal is to fulfill the academic needs of every student. We will continually strengthen the environment in which the students learn to ensure quality education. Our students will continue to achieve academic success in this changing academic environment while our school evolves to meet new standards, use new technology, and employ the best available practices. Life-skills such as subject studying, note-taking and organization, responsibility, communication, accountability, and team-building are integrated into a comprehensive curriculum. We also offer an After School Program from 3:00 PM to 6:00 PM for students in grades pre-school through eighth grade. Religion – Students of all faiths are welcome at Saint Albert the Great School. The religion curriculum of the Archdiocese of Cincinnati is designed to help students grow in their knowledge and practice of the Catholic doctrine and Gospel values. Each student participates daily in formal religious instruction, attend weekly liturgies, and are members of school Faith Families. Additionally, students are active in a variety of service projects to help them grow in their social awareness. Language Arts – The Archdiocesan Graded Course of Study has been developed from the widely used National Standards for Language Arts. As such, the program is designed to develop the students’ ability to communicate through writing, listening, and orally. Time is set aside for instruction in reading, writing, spelling, and grammar. These skills are also integrated in our content subjects. Reading: As students develop their skills with decoding and reading fluency, they are exposed to a wide variety of literature. Instruction is supplemented by student participation in the Accelerated Reader Program, which allows students to select and read books at their own reading levels. Students are also supported in reading through weekly library visits, a reading specialist, and our school tutor. English: Students develop skills in grammar, spelling, and vocabulary early in the curriculum which enable them to become better in the process of writing. They are exposed to different styles of writing (narrative, poetry, letters, journals, essays, and persuasive writing, etc.) as they progress through the curriculum. Math – The Archdiocesan Graded Course of Study has been developed from the widely used National Standards for Math and is designed to improve the students’ critical thinking and problem solving skills. The curriculum also provides the classroom teacher with identifiable and measurable objectives at each grade level. Students who have mastered all grade level objectives and display an above grade level ability with the math curriculum and on standardized tests may be chosen to participate in the Algebra program in their 7th and 8th grade years. This is a high school level class designed to move students into Algebra II or Geometry as a freshman in high school. Students in the Algebra program study real number properties applied to algebraic expressions, and solve equations and inequalities. Other topics include: polynomials, factoring, rational expressions, graphing, systems of equations, functions, inequalities in two variables, irrational numbers, quadratic formulas, and statistics. Science – The primary objective of the science program is to help students develop an understanding of the various areas of science, while developing skills needed for scientific inquiry. The science program subjects include: earth/space science, life/biological science, and physical science and are taught in grades PK – 8. Students are encouraged to learn through STEM methods that include: hands-on activities, field trips, and school assemblies. 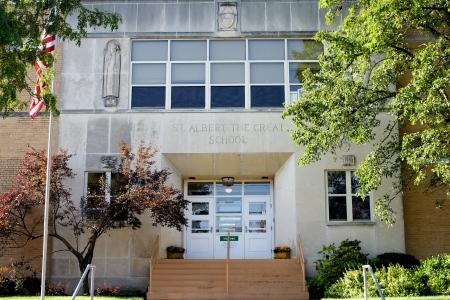 Social Studies – Social studies, as taught at Saint Albert the Great, is to focus on peace and justice issues. Students learn to view the world through Catholic teachings and to apply those beliefs/values to social issues. Through these teachings, the curriculum aims to help children make discoveries about the people, culture, geography, and history of their home communities as well as other nations and cultures. In addition to studying people, places, and events that shaped history, students acquire and practice skills that will allow them to identify and analyze social problems. Spanish – Students in all grades receive instruction in Spanish two days a week. The students learn basic vocabulary and simple grammar structures that will enable them to develop speaking, reading, and writing skills. The study of the language also includes a broad introduction to customs, geography, and culture of the Spanish speaking countries throughout the world. Students have the opportunity to earn high school credit upon the successful completion of the program. Technology – The use of computers and other electronic technology are integrated throughout the curriculum developed by Saint Albert the Great School. In addition to computers in each classroom, our computer lab is state-of-the-art and our 30 laptop computers are available to students for classroom instruction. Music – Music is an essential part of a student’s overall education. Research has shown that a student with a music background will perform at a higher level academically than a student who does not participate in music. Students learn the eight elements of music: melody, form, rhythm, tempo, dynamics, tone color, harmony, and texture. Using these elements students; sing, use movement, and play various percussion instruments. The program also tries to include a balance of an appreciation of music, a knowledge of its historical and cultural aspects, and the ability to produce music. Art – Through the elements of design of line, shape, form, color, texture, and space, the students will explore a variety of approaches and media. This requires the skills of following directions and demonstrating pride in one’s work through good craftsmanship. The program includes a balance of appreciation of the arts and knowledge of historical and cultural aspects. Health – Health class develops a solid understanding and awareness of the human body and how to properly care for and protect it. This includes education on good health habits, practicing safety, and becoming aware of the major health issues of our society. Physical Education – Physical education helps students to develop mentally, socially, and physically. Each unit of instruction emphasizes progressive development of the major motor functions required for the physical activity. Beyond the development of movement skills, the physical education program seeks to encourage life long involvement in physical activities. Primary Grades – the emphasis of the program is on movement and motor skills, and basic skills development. Intermediate Grades – continues to work on motor skills, especially those that ready the student for full participation in recreational activities, sports, and games. Junior High – a majority of the time will be spent doing lead-up activities, learning rules of different sports, and playing games. Additionally, students have an opportunity to participate in a fitness program designed by Personally Fit Gym. Students receive instruction in activities to improve: strength, endurance, power, cardio, balance, and total wellness. Enrichment Classes - Students in grades 6 - 8 are given the opportunity to take an enrichment elective class once a week that changes each quarter. Each grade is required to take 1 quarter of health each year. All 6th grade students will take Personal Health Wellness, 7th grade students will take Mental Health, and 8th grade students will take Alcohol, Tobacco, and other Drug Prevention. Students are given the chance at the end of the school year to choose what elective classes they would like to take the following year. We cannot guarantee the classes due to scheduling but will do our best to schedule you in your choices. Other enrichment classes offered: Bible Study/Liturgical Prep, Careers, Cooking, Creative Writing, Drama, Engineering, Personally Fit, Public Speaking, Research/Current Event, and Robotics.